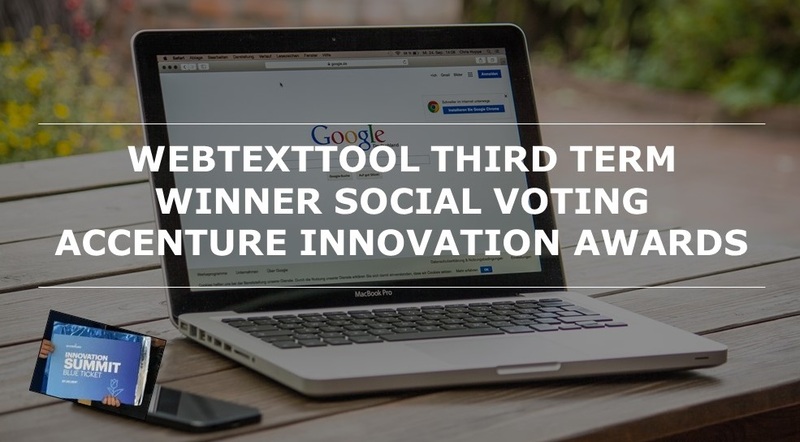 We’re happy to announce that webtexttool is the third term winner of social voting for the Accenture Innovation Awards! In the last two weeks we’ve collected the most social votes (Twitter, Facebook and/or LinkedIn). As a term winner, we’re invited to pitch at the Innovation Summit on October 27th, where over 2000 guests from the business top, government, and entrepreneurial community will gather. Marcel Leeman, co-founder of webtexttool: “We’re very proud that webtexttool is a term winner of the social voting period. It’s a great boost to see that the public appreciates our concept”. The participant that collets the most socal votes in total wins the public prize. The voting period ends October 20. Go to the Accenture Innovation Awards website and give us your vote to win this public prize! The Accenture Innovation Awards is a yearly event organized by Accenture and rewards the most innovative products, services and concepts within the Netherlands. Startups with exceptional performance in innovation or sustainability, which are younger than three years can compete in eleven categories in order to win the best innovation award, the most sustainable innovation award and the public award. Webtexttool has been nominated for the Accenture Innovation Awards in the category Intelligent Enterprise.